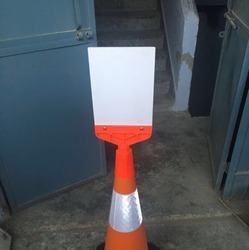 Prominent & Leading Exporter from Mumbai, we offer flexible traffic cones, traffic cones, safety cones, retractable traffic cone topper, traffic cone hooks and cone connecting rod. Weight 4.5 - 5 kgs approx. 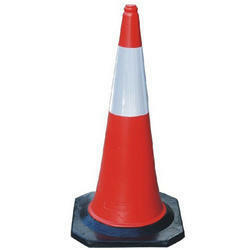 Traffic Cones are placed on roads or footpaths to temporarily redirect traffic in a safe manner. 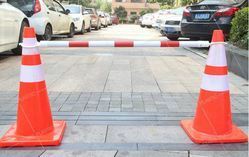 They are often used to create separation or merge lanes during road construction projects or automobile accidents, although heavier, more permanent markers or signs are used if the diversion is to stay in place for a long period of time. It comes with reflective tapes of various widths. It has rubber base for stability. It comes as flexible too. It can also have a provision of Hook at top for attaching plastic traffic chains. With more than two decades of experience in the field of Industrial Safety Products, we have emerged as a respectable leader for the supply of Traffic Cone. Base: 385 mm x 385 mm approx. Can be used with other accessories like Traffic Chain, Light Bar, Reflector, Message Plate, Caution Tape etc. 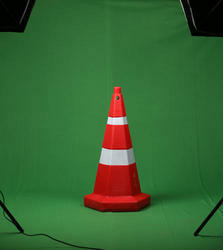 This Barricading Cone conforms to government standards and industry regulations. 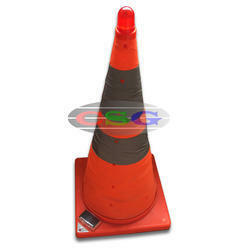 New models of this Lane Marking Cone keep developing to produce higher quality products without cutting a corner. 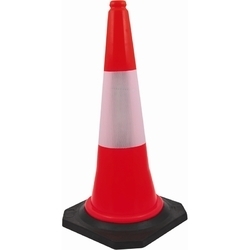 We have over two decades of vast industrial knowledge and experience in producing superior quality Accessories for Traffic Cone. We offer an extensive and comprehensive range of Plastic Cone Hooks. This product Cone Accessory is designed keeping in mind all innovative approaches to workforce safety and demands, made by industries worldwide. Our Plastic Chain Connector is used in work areas which are prone to higher risk of accidents. Features Cab be fixed/removed on any cone very easily. 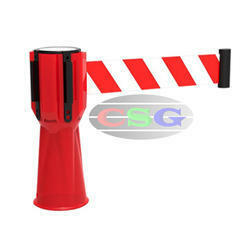 Usage/Application Good for Barricading or Block a space. - Cab be fixed/removed on any cone very easily. - Any message can be planned. - Used with other Accessories like light bar, reflector, message plate, Caution Tape etc. - We can use cone-connecting rod to make ti use as a barricade. With more than two decades of experience in the field of Traffic & Road Safety Products, we have emerged as a respectable leader for the supply of Accessories for Cone. 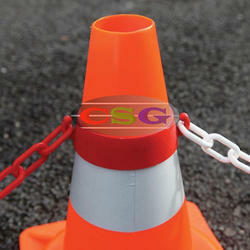 Our product Traffic Cone Connecting Chains was developed keeping in mind the safety of people working in outdoor areas or work sites. This Cone Accessories Supplier conforms to government standards and industry regulations. New models of this Link Chain keep developing to produce higher quality products without cutting corner. Looking for Traffic Cones ?